After three days of calm campaigning on both sides SAUJS and PSC clashed at the Chamber of Mines building. Rashaad Dadoo, centre, confronts reserve IDF soldier Ashager Araro, left, outside the Chamber of Mines building at Wits University during Israeli Apartheid Week. Photo by Ortal Hadad. A guest speaker for the South African Union of Jewish Students (SAUJS) at the Israeli Apartheid Week (IAW) was escorted off the Wits University campus on Thursday, April 4, after it was found that she is a soldier. Ashager Araro, a well-known Ethiopian-Israeli Zionist and reserve soldier of the Israeli Defence Forces (IDF) left the campus surrounded by private security after supporters of the Palestinian Solidarity Committee (PSC) confronted her about her military role. PSC and SAUJS supporters found themselves in a heated and tense exchange over Araro as both groups of students converged on the piazza in front of the Chamber of Mines building. “You guys are letting soldiers on to our campus now, we’ll note this,” said a Palestinian supporter to Jabu Mashinini, senior programme adviser for student governance, in reference to Araro. Mashinini told the group that she had had no previous knowledge of Araro’s role in the army. ‎Mashinini later told Wits Vuvuzela that while there was no official university policy preventing the presence of military personnel on campus, both SAUJS and PSC had agreed to keep military presence out of their IAW campaigns. “There is no policy forbidding soldiers from campus, it was an agreement between the two said parties that active soldiers will not form part of their activities,” she said. Rashaad Yusuf Dadoo, a PSC supporter, found himself encircled by private security and carried a few metres away from the crowd after he made several allegations against individual members of university management during the altercation. Dadoo said that he refused to accept the status quo of the university, even if it meant being physically assaulted by campus security. “They (Wits management) get you to come and remove us from this campus, students who have the right to be here, and people who aren’t allowed on this campus are protected,” Dadoo said to private security officers. Second-year Accounting Science student Ammarah Patel told Wits Vuvuzela that the use of force by private security was nothing new for IAW. “How is it fair that Rashaad who was literally just speaking, I’m not even going to mention the fact that [Araro is] a soldier [and] not allowed to be on campus, [Dadoo] was speaking to someone and private security thought, ‘Now’s the good time to move him away?’ How does that seem fit?” said Patel. 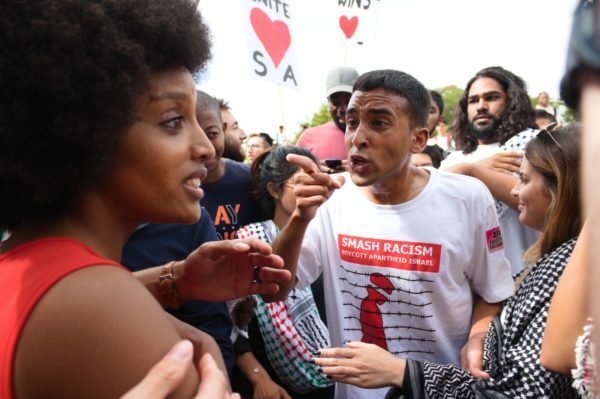 Political and Liason Officer of SAUJS, Ariel Goldberg, told Wits Vuvuzela: “People got very violent very quickly, lots of shoving, lots of pushing, and it seemed private security’s first objective was to separate the two parties that were having an altercation. That seemed to be accomplished by quite a bit of force,” said the BCom Politics, Philosophy and Economics student. The crowd eventually dispersed of their own accord after about an hour. IAW is an annual event observed globally and focuses on the conflict over the occupied territories in the Middle East.